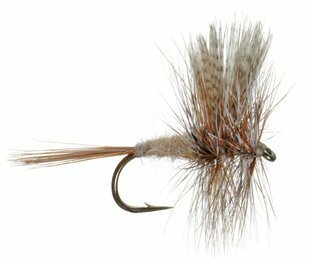 Trout flies as a category are probably more technical than many other types of flies. For the most part, they are designed to imitate various life cycle stages of aquatic insects. We use the scientific names of the insects themselves to classify our patterns and study their habits to become better anglers. Our library of recipes has been subdivided into catagories as fine as possible to further aid in the scientific awareness of these aquatic insects. Dry flies in particular are subdivided into its many insect types as well as design styles possible due to the vast numbers of patterns available. Individual patterns can vary greatly with color schemes as well as pattern styles and material used. There is often a choice of either synthetic or natural dubbing materials in many patterns as well as a wide range of hook sizes to match the natural.